Mahoney Architecture » The 2016 Remmie Awards – We Won! The 2016 Remmie Awards – We Won! Receiving an award is always nice. We just got two (!) and we are so proud. This year we submitted two remodeling projects we did in 2015 and took home awards for both. We were awarded First place for “Residential Detached Structure” which was a pool/guest house in Tiburon. This project was a challenge due to the small space (ie: a closet became a kitchen) and the result is a gorgeous and totally functional space. 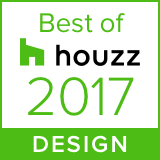 We also got First Place for “Entire House under $250K” for a project we did in the East Bay. You can see before and after pics here.